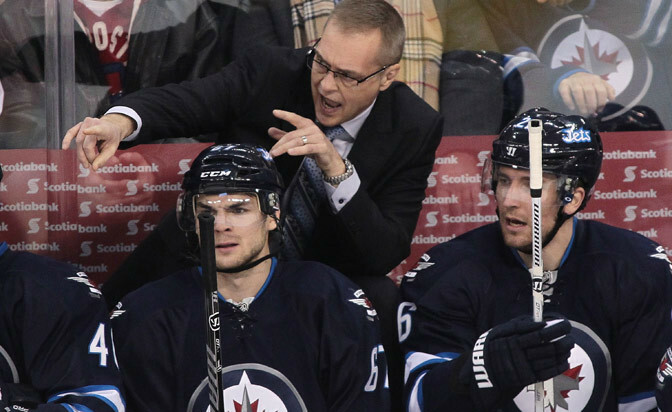 He's seven games into his tenure as the coach of the Winnipeg Jets and so far it's been all good for Paul Maurice. The Jets are 6-1-0 since Maurice replaced Claude Noel. They've scored 24 goals and allowed only 13. They became the first team this season to beat the Anaheim Ducks in regulation at Honda Center. Their lone loss was a 1-0 defeat on the road against the San Jose Sharks. They're coming off what can only be described as a huge and surprising 3-1 win against the Chicago Blackhawks at United Center on Sunday. Chicago outshot Winnipeg 27-6 through 40 minutes but Jets goalie Al Montoya was spectacular and Winnipeg found some breaks in the third to get the win. Andrew Ladd scored the winning goal around two from Blake Wheeler. After being out of the NHL for more than two years Maurice clearly has a lot to talk about now. We gave him the opportunity. What has been your biggest adjustment with this team? "The Western Conference travel is the one I spend the most time talking about; just the number of days that are almost scheduled to travel. We had a short flight [Sunday], it's only an hour and a half [from Chicago to Winnipeg], and the guys got in at 2 a.m. after clearing customs and everything we go through. It's about when to practice the team. We are going to be playing [Tuesday] and our last practice was Monday the 20th. That's the challenge. You're trying to change and implement some things and your schedule doesn't allow the same type of practice time you have in the East. In the West you watch a lot of hockey, you know the players and you have experienced guys on your coaching staff so that hasn't been a challenge, but that travel, logistically for what we're trying to change, that's been a big one. "The big question we have now is we've got the 29th and the 30th as off days or practice days. We haven't practiced in a week, but the 29th is right after five games in eight days. In the East there would be no question we just wouldn't skate on the 29th because we would have practiced more on those other days. That's the big adjustment." How has that hectic schedule and lack of practice time affected the implementation of your systems and coaching vocabulary? "There are three phases of what we want to accomplish and we had enough practice time the first week that we have really just addressed one part of our game. We've talked about all parts, but on ice we've had a strong focus on one part of our game and we'll continue to do that. The goal is to get through two phases of it before the Olympic break and deal with the third phase during the Olympic break. So we're on track, it's just that we've done a lot more of it on video than on ice and I think any coach would rather get out on the ice and make sure you have repetition with what you're trying to accomplish. "We started with defensive hockey and we're just starting to talk about our offensive game now. Then we'll get into our neutral-zone concepts. Those are the three main systems and that was specific to this team. The area that needed the greatest work was defensive hockey." You get outshot 27-6 through two periods in Chicago yet you still come away with a 3-1 win. What did you learn about your team Sunday? "You know what? They're resilient and they're willing to stay in the fight. These guys have shown nothing but a willingness to compete, to scratch and claw, and to react positively after some adversity, be it a goal-against or even a turnover. They work hard at not making the first mistake become the second mistake. I'm really impressed with that. But to be honest with you I thought that was here before from the games that I watched. This is a young group and they're excited and eager to compete." Is Dustin Byfuglien a forward or a defenseman, and do you think it has to be defined for him? "He's both. He can play both positions and excel at both positions. He's that good. Right now he's been a real important piece up front and when we put him back on the power play, back at 4-on-4, he generates offense. "I don't [think it has to be defined] and I think that would be a mistake. I'm going to put Dustin Byfuglien in a position to excel. Right now he's excelling up front and that's why he's up front. Usually when you've got a player that's a swing player he's not a difference maker in the game, so you're putting him back on [defense] when you've got a couple of guys that go down or a guy in the penalty box and you're hoping he can just get you through a shift or two, but the opposite is true with him. We're putting an elite player in either of those two roles, up front or on the back end." What have you seen from your two young players, Jacob Trouba and Mark Scheifele, and how have you gotten to know their games so far? "We've learned their game by watching them play big minutes and we're not putting these guys over the boards for development ice time. We're putting them over the boards because they help us win hockey games. I just don't look at them as young players and I know they are. Maybe you do give young players more room to grow but they're not making any more mistakes than anybody else. The fact is the opposite is true. We're 6-1-0 and after the first four games Trouba was plus-9. Scheifele has been a piece of big, big goals for us. They're adding. We're not waiting for them to contribute. They're doing it right now and because of that we don't view them as young guys. We're certainly not shielding them. "We went on the road into Anaheim and into San Jose where Bryan Little is the center we'd normally play against the top-end guys in both places. Well, we don't get last change, so Scheifele saw a lot of Ryan Getzlaf and a whole lot of Joe Thornton and was able to play well against them. "And Trouba is just growing into his frame. He's going to get stronger. His leg strength will get more powerful. You love the plays he makes because there is a skill level there that not a lot of people have, but what goes with it is his puck protection down low. He's playing against big men and holding onto the puck. Usually those skilled defenseman aren't able to handle people down low but we're playing him with Mark Stuart and they're playing against guys like Getzlaf and Thornton. He's been a big player for us."